Tired of your dog pulling you on a walk. 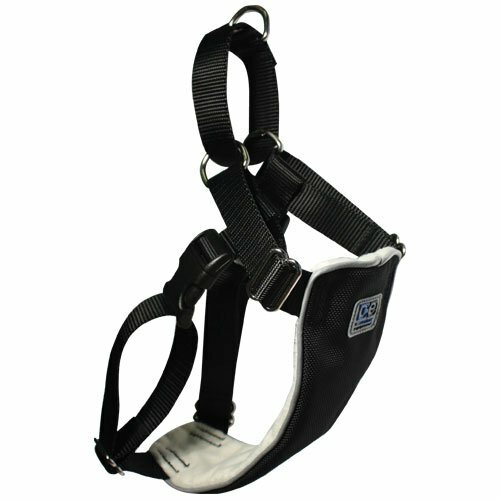 The canine equipment no pull harness is a humane training harness for dogs that like to pull while on a leash. The no pull harness features a martingale loop along the back of the harness that provides gentle pressure to the front chest and underarm to discourage pulling. With this harness and positive reinforcement training techniques, dog walking can become comfortable for both you and your dog. Harness is made from 1050d ballistic nylon chest panel and features a plush inner lining for comfort and bartacked stitching for strength. Other features include nickel plated hardware, low profile metal slides to prevent irritation, contoured buckles and reflective piping and label. Machine washable and available in sizes small to extra large.